Hachee is a traditional beef and onion stew found in virtually every Dutch home. It’s a delicious comfort dish to enjoy during the cold winter months. The long, slow cooking time produce super tender meat and a rich sauce with wonderful depth of flavor. Here is an authentic recipe that you’re whole family will enjoy. The word hachee has its origins in the French hacher, meaning “to chop” and Hachee is sometimes referred to as a “hash.” Hachee has been around since the middle ages and like many of the traditional dishes of Europe that we know and love today, it was originally a peasant dish, created as a means of using up leftover meat and vegetables. The vinegar was used to tenderize tough pieces of meat (much like French peasants used wine). 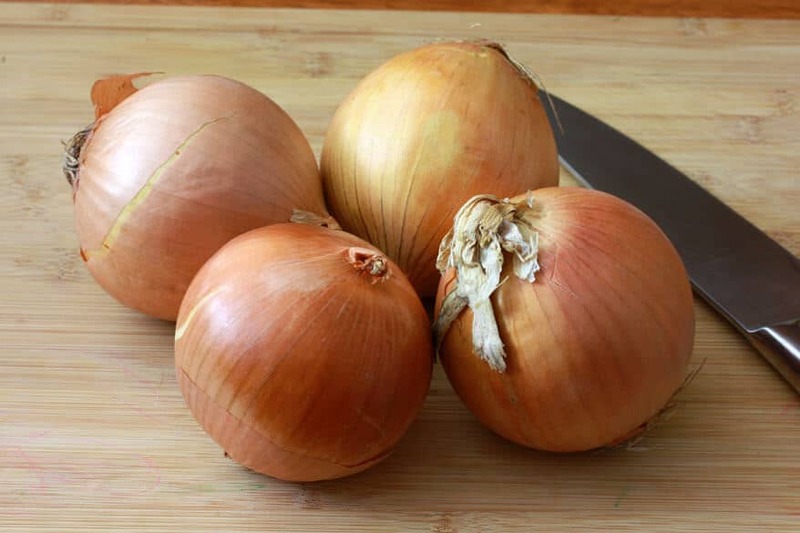 Less expensive vegetables likes onions were used in generous amounts. A long cooking process further ensured the meat would be tender. Hachee remains a popular and much-loved dish in the Netherlands. So much so that you can find it ready-made in grocery stores. But nothing beats homemade, and your patience in the long, slow cooking process will yield results that you’re entire family will love. 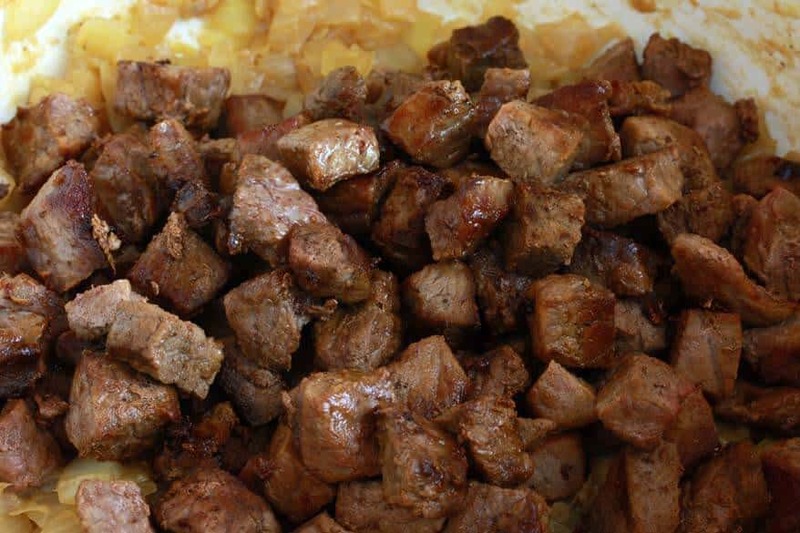 The flavor profile of Hachee is significantly different from the traditional beef stews we know here in the U.S.. Hachee uses equal parts of beef and onion and the onions are caramelized. 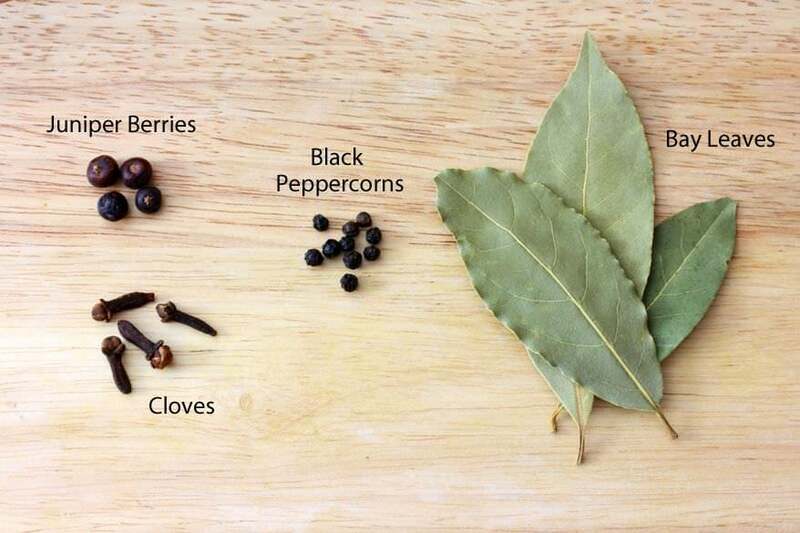 The featured flavors in this stew are cloves, juniper berries, black peppercorns, bay leaves and vinegar – all of which come together to provide a wonderful depth of flavor that is both rich and comforting. 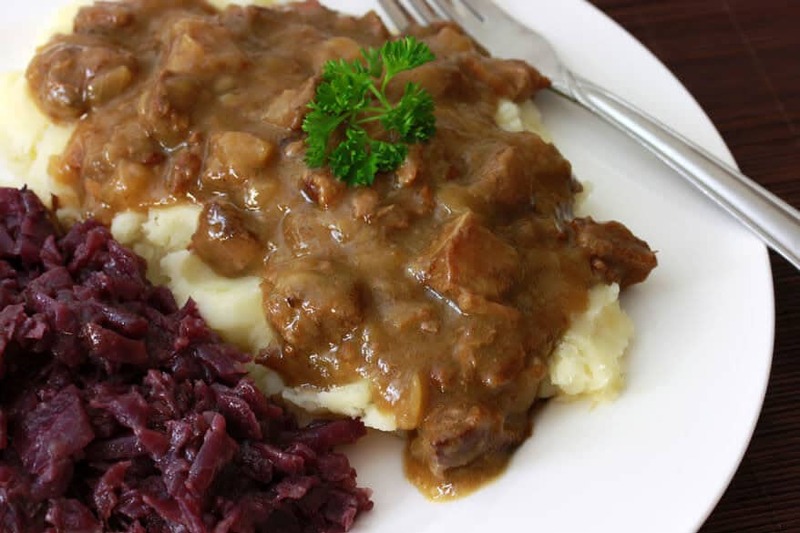 The flavor of Hachee shares similarities with German Sauerbraten. I made this last week when my husband’s family came to WA for a visit. My father-in-law lived in the Netherlands for two years as a young man and fell in love with the country, its people, and its food. Many of the dishes he enjoyed then he hasn’t had since – almost 40 years later – a fact he often laments. (Sorry for alluding to your age, John.) So I wanted to surprise him with a traditional Dutch meal. I narrowed it down to three options: Boerenkool Stampot, Hutspot, and Hachee. I decided on Hachee. It’s a little more interesting, plus you can’t find the smoked Dutch sausages (rookworst) here that are traditionally eaten with the other two dishes. And it also gave me the excuse to finally make the braised red cabbage with it – a side dish that is equally popular in Germany (Rotkohl) and that several of my readers have asked me about. My father-in-law readily recognized the dish. “This is the dish I had almost every night during my first two months in the Netherlands!” And he hadn’t had it since until now. We all really enjoyed this Hachee. And the leftovers the next day, after the flavors had even more time to meld, were even better. Cube the beef and pat it dry with a paper towel – this will ensure that it browns well. Sprinkle with a little salt and pepper. Brown the beef in a Dutch oven. Brown the cubes on all sides. 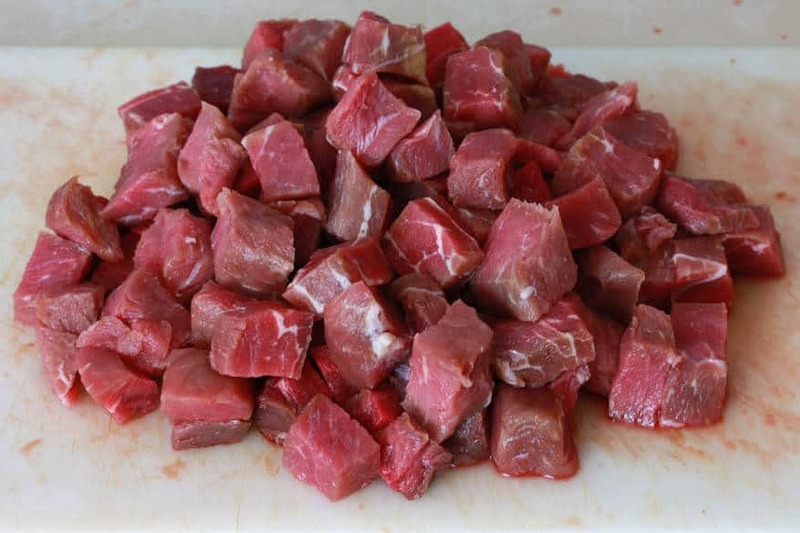 Brown in batches so as not to overcrowd the beef – that will prevent it from browning properly. 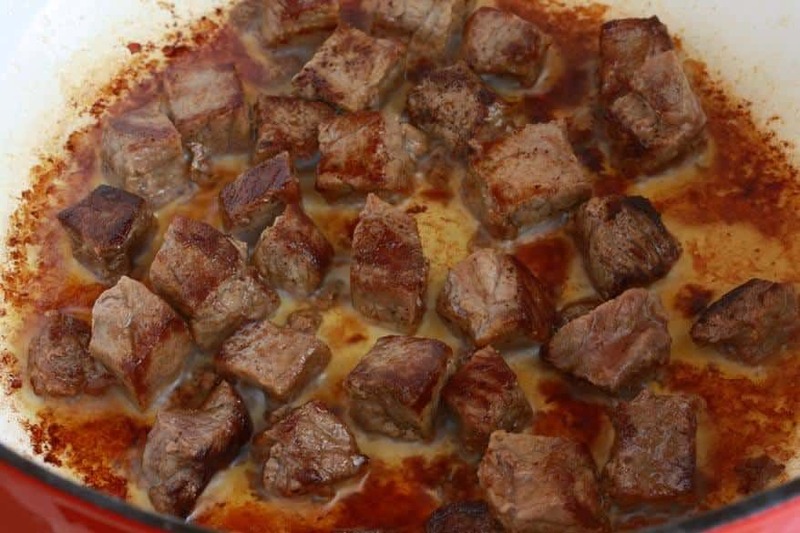 Remove the beef and set aside, leaving the burnt bits on the bottom of the pan – those will provide a lot of flavor to the stew. Add some more butter and caramelize the onions until golden brown. Add the flour and stir to combine. Add the beef broth and the seasonings. Bring to a boil, reduce the heat to low, cover and simmer for 2 1/2 hours. Uncover and simmer for another 30 minutes to help thicken the sauce. 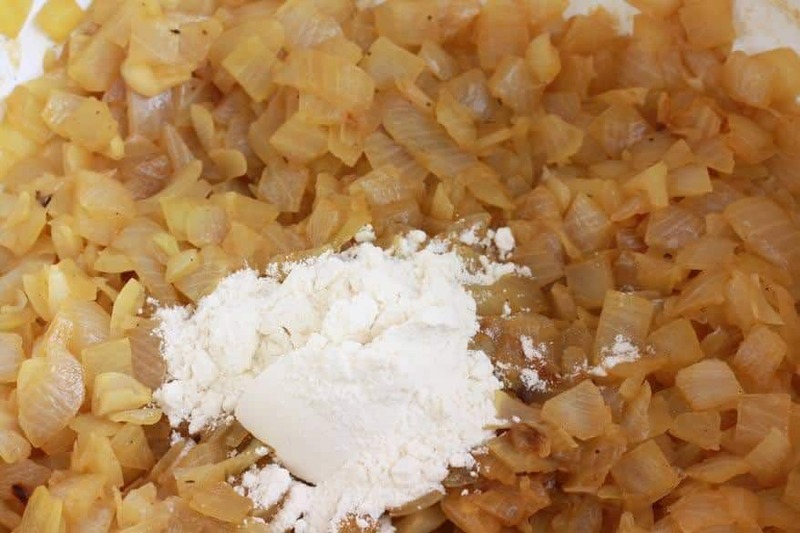 If it needs further thickening, make a slurry with equal parts of flour and water and stir it into the stew, stirring constantly to prevent lumping. Return to a simmer until the stew is thickened. Add salt, pepper and more red wine vinegar to taste. 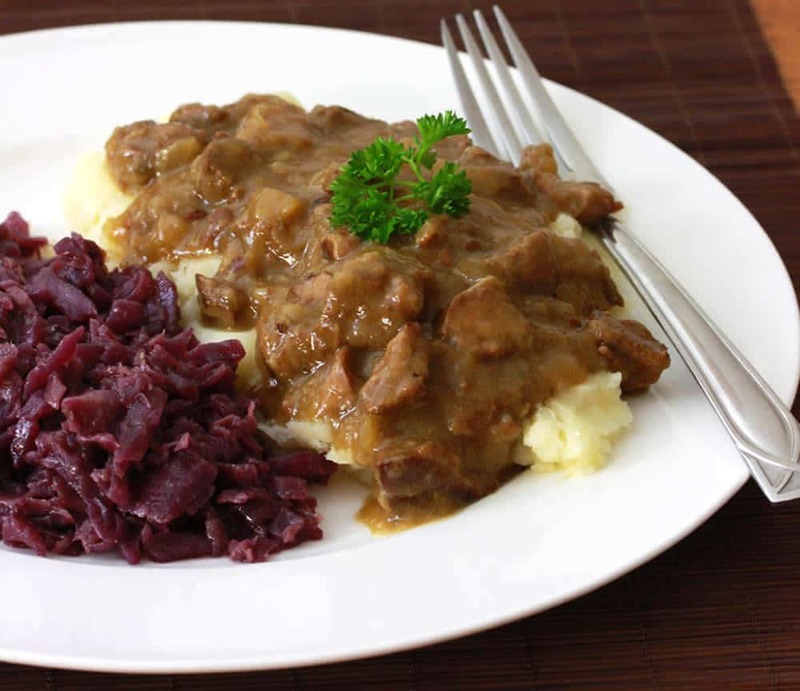 Hachee is traditionally served with aardappelen (potatoes) and rode kool met appeltjes (braised red cabbage with apples – click for recipe). A serving of applesauce is also common. Eet smakelijk! Melt the butter in a Dutch oven over medium-high heat. Brown the beef on all sides, working in batches so as not to overcrowd. Transfer to a plate and set aside. Leave the browned bits in the pan (important for flavor). Add the onions and some more butter if needed and cook until caramelized, about 25 minutes. Add the flour and stir until combined. Add the beef to the onions, stir to combine, and cover with the beef stock just until covered. Add the seasonings and red wine vinegar, stir to combine. Increase the heat and bring the stew to a boil. Reduce the heat to low, cover, and simmer for 2½ hours. Uncover and simmer for another 30 minutes to further thicken the stew. Add salt, pepper and more red wine vinegar to taste. Serve with mashed potatoes and braised red cabbage. Kimberly, thanks again for a wonderful evening and Dutch dish. It was fantastic! You’re meals are a real treat! John, you’re so welcome and thank so much for stopping by! a great hearty dinner for this weather! It sure is – can’t believe what’s going on out East! 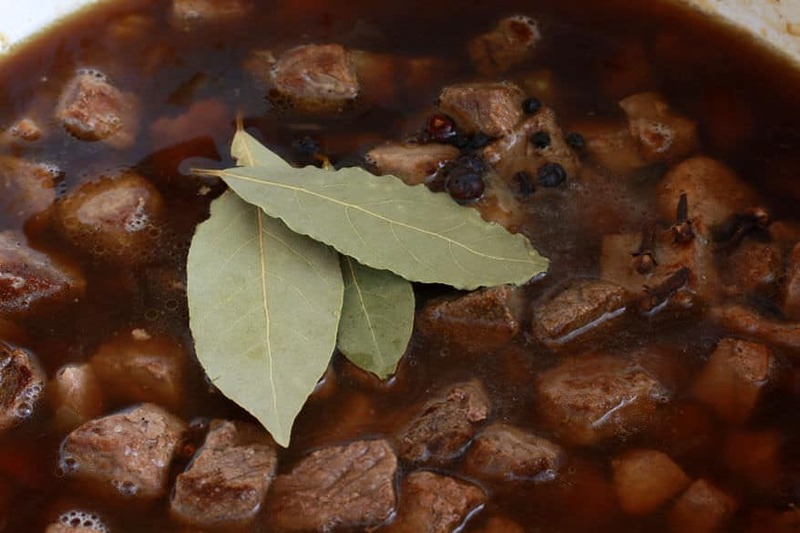 Thanks, dear Bridget :) I love the seasonings in this stew – the cloves and juniper berries are a really nice touch. It has a really nice flavor, Maria. It’s very much a “home cooking” meal and one you won’t find in restaurants – but maybe you’ll be fortunate enough to be invited over to someone’s house for a bowl of it :) Have fun in Amsterdam! Great tip for anyone living in that area of the UK, thanks! Definitely worth it to make a day trip of it – Welshpool is an amazing historic city in a breathtaking area of Wales! Hi, need to make a larger amount of stew can I multiple the ingredients by the amount I need. Absolutely! You can simply double everything. I just happened on your site because I was looking for a deviation of my mothers family recipe. Hers (ours) was from their time in Holland just after the WAR. Our recipe does not seem to use as much meat or any of the spices of yours. I am not familiar with the juniper berry flavor or the use of cloves. Other than these two varients the recipe is the same. I love the Hachee to death! It is one great meal, but next time I will expand my horizons because this recipe sounds better than ours. Hi Bob! I’m not surprised the version you have is a little simpler – after the war many ingredients that we take for granted were impossible to find and people made do with what they had. Juniper berries and cloves especially would have been luxuries at that time. They add a ton of flavor to this dish, I’m sure you’ll enjoy it! Thanks, Sylvie, it’s super good! The spices in it give it such a great flavor. This is not hachee, this is the recipe for ‘Stoofvlees’. To make this proces easier we tend to put a piece of gingerbread in it, since it already has those spices in it, and the bread replaces the need of flour. Hachee is a stew heavily influenced by the VOC, due to the accesabillity to asian spices. Hi Grietje, I think you’re confusing these dishes. I’m familiar with Stoofvlees (aka, carbonade flamande) – it’s a Belgian stew made with beer and is very different. I’m also familiar with different versions of Hachee and while I have seen some instances of cardamom being used, those recipes have been more modern. I have never heard of anise, ginger or cilantro being used in this. Perhaps you’re referring to more contemporary versions of Hachee? Hachee is a peasant dish dating back to the Middle Ages and cardamom, a luxury spice, would have been virtually inaccessible to the poor. Again, perhaps more contemporary versions have put an Asian spin on it, but this recipe is for a very traditional Hachee. Any replacement for Juniper berries ? I don’t seem to find it here in the middle east. Hi Aishah, they have a very distinct taste and there aren’t any adequate substitutes for them. I just did an online search and several sources say you can substitute 1 teaspoon of gin for every two berries, but I’ve never tried that and am not sure how it would taste. @Grietje Cinnamon and cardamom are not spices used in hachee. The sugar, yes. Maybe nutmeg though I personally never use that. The cilantro, ginger and anise really made me raise my eyebrows. I’ve never heard of it. Never seen it used in any hachee recipe. I don’t use it and neither did my mom. A lot of people do like to use ginger bread in the hachee, I’ve never done so either. There are also a lot of different versions of hachee. There is no ‘absolute’. This is definately a good hachee recipe, though I will admit I did miss the teaspoon of sugar. And I never use juniper berries. Though you are right about certain things, you are not right in claiming this is not hachee. Thanks so much for providing the recipe for Hachee like my mom used to make! My mom never had the patience to teach me any of her Dutch cooking and 2 of my 3 brothers have been missing her cooking since she passed 6 years ago! They are going to be so excited! Thanks so much! Thank you, Carole, I’m really excited that you’ll be able to take your family down memory lane – what a special meal that will be! The traditional dish suggested it designed to use left overs yet all of the recipes suggest using fresh mat and onions. I agree the dish is an excellent meal and may be combined with a lot of variables to complete it. Carmelized turnip is one of my favourites. Hi Kimberly, I was brought up in the Netherlands and we always had Hachee with Hutspot (leftovers with rice). if you wanted to combine the 2 traditional Dutch dishes next time your father in law comes over it is well worth a try. Thanks for the tip, I’ll keep that in mind! My Mum always used the basic Hachee recipe from the 1964 “Magriet Kook Boek”, with a couple of variations. I still use the same recipe and always serve it with Stampot. The spices in this recipe are identical to yours but instead of using juniper berries, we add 1 finely diced Granny Smith apple (a tart apple in Australia), 1 tsp of sugar and we use white vinegar instead of the red wine vinegar. I will certainly try your version next winter. Thanks for sharing, Theresia. The addition of the apple sounds lovely. Yes, give the juniper berries a try next time, they really add a wonderful flavor element to the hachee. Juniper berries are a common ingredient in many traditional Dutch and German recipes. While cleaning out my father’s home I found several premix packages of hachee mix. Being Dutch I thought I should look into it and found your site. This is one dish that my parents never introduced me to while growing up. I had heard the name mentioned in passing. Somewhere along the line my father re-acquainted himself with this dish. I am going to make this dish when I get home from this trip. I grew up with boerekol including the smoked sausage. The closest I’ve come to that taste and texture is made by Harvest and is sold in Costco and a few other places. There may be a variance of sausages that Dutch people use so the Harvest sausage may not ring bells for everyone. I’ve signed up to your site. Thanks for the reply. Yes! We found the Harvest sausage years ago….just like the taste and texture of the one my mother used. My brother is stubborn and won’t try it…..his loss. Before Kale was popular and fed to horses I had to grow it myself. Sometimes the only kale I could get was the decorative Kale, but that eats just as well. I put my kale in a plastic bag in the freezer, not just to help the taste, but when it’s frozen and I want to cook it, I crush the bag to bits…..no more cutting or chopping…..just take out the stems. When Wendys had their salad carts (years ago) I was always tempted to ask for the kale they used to trim the cart, but I never had the nerve. I also make hutspot but it’s more difficult to get the bacon (spek..spelling??) that you cut into small cubes that my mother used. I often buy packages of bacon ends that are a mix of sizes and shapes that don’t look pretty in the regular bacon strip packages. My father told me that a young boy climbed over a fence when the Spaniards occupied Holland and stole the food that they were eating. Apparently, Hutspot is originally Spanish. I also make several Indonesian dishes inherited from the Dutch colonies, some with curry. My family is also born here and love the food as well……..but their spouses, not so much. I guess you have to grow up with it. Thanks for the reply. Yes! We found the Harvest sausage years ago….just like I remembered the taste and texture of the one my mother used. Definitely looks like a great recipe! My mom would also make Hachee, but without the vinegar and we would put it on bread when I was a child. Delicious… like a hot beef sandwich. Thanks for sharing this recipe! That sounds like a yummy way to eat it, Ann, thanks for sharing! I am Dutch. Having been married to a American GI I have tried to introduce as many of my dishes to our meals as I can. At home we never served Hachee with Hutspot or Boerenkoolstamp. Boerenkoolstamp indeed with Rookworst and Hutspot is served with Klapstuk. My mother always made Hachee with leftover meat from making the Sunday soup. This meat was always used to make other dishes (saves money.) She would sometimes leave some meat in the soup but most times she would make little meatballs from a little ground meat and the marrow from the bones she made the soup from. Then from the beef she would make for instance Kroketten or Hachee. Hachee was always served with boiled potatoes and red cabbage. My hachee always has vinegar and sugar in it. It wouldn’t taste right without it. Hi Kimberly, my family migrated to Australia in 1955 from Holland and my mum used to make this dish which I loved. Yours is the equal to if not better. Thanks so much for sharing it. Wonderful, Hans, thank you so much! Hello Kimberley, how lovely and interesting to find a Hachee recipe outside the Netherlands (I live in Almere, a suburb of Amsterdam). Cooking is a passion of mine and I use international dishes but also recipes given to me by my mother and grandmother. For hachee I have a slightly different recipe given to me by my grandmother and here it is. Use the ingredients mentioned but drop the cloves, the flour and the red wine vinegar. Instead add white vinegar a tablespoon full. Add sugar a teaspoon. Add nutmeg half a teaspoon. For meat use beef ribs cut like you mentioned. I usually prepare the dish a day in advance. Let it cool down then reheat it slowly and let simmer for another hour before serving. Serve the hachee combined with cooked floury potatoes and cooked red cabbage. Lastly, a Dutch oven works perfect but any pan with a lid and suitable for stewing works great also. PS, I have alternative meat dishes to combine with Dutch stamppot instead of Rookworst, for example “Draadjesvlees”, let me know if you are interested. Hi Robin, thanks for sharing your family’s version. Agreed, stews like this are always better the next day after the flavors have had time to meld. My parents came to Canada after the 1st war. Mom made hamburger with onions and there was vinegar but I cannot remember what else she put in there,but it was served over mashed potatoes and so good. Was this just a home made recipe?? Or is there a Dutch recipe for this.? I do know how to make the borenkool and stampot with carrots. Just love the Dutch meals. I am not sure what is meant. There is a quick dish with no specific recipy name that I know of with the same seasoning as hachee yet using ground beef and which is baked instead of stewed. It takes a lot less time because stewing is not necessary, however it tastes and looks a lot different from the traditional hachee like it is mentioned in this recipy. However Laura mentiones a hamburger with unions and vinager. Here in Holland we have something called a Duitse Biefstuk which translates into German hamburger. As far as I know it is not native to Germany and exists in several European countries but specifically in Holland it is called like that. It is finely chopped beef with extremely finely chopped unions, ground cloves, an egg, seasoning and it is shaped in the form of a hamburger. You bake it, considerably longer than a hamburger because usually they are made considerably thicker and heavier than a regular hamburger. You can serve it with many potatoe and vegetable dishes including the Dutch stampot dishes or a chicory salad for example. i wonder if this dish could be adapted to slow cooked sheep shanks? Hi John, I don’t see why not. I would follow the steps as outlined, giving the shanks a good browning, and then in Step 3 add everything to the slow cooker and cook on high for 4-5 hours or on low for 6-8 hours. Check it a bit earlier to see if the meat is fork tender. Hi Leanne, yes correct, place them in whole and remove them at the end. Happy cooking! I made this dish for the first time and my family and son-in-law just loved it. I was wondering…..could this dish be made with a whole roast as well? Wonderful, Anne, thank you! Absolutely, you can do a whole roast. Mariska street got it all perfect hutspot, boerenkool hachee. 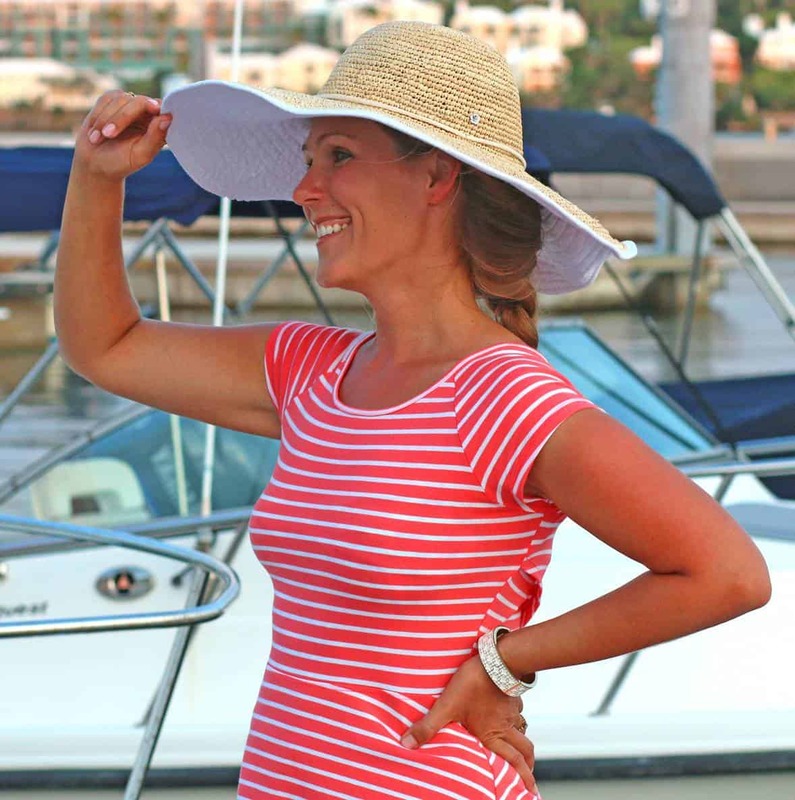 By the way one in my family hates…. onions so i have tried carrots with leek instead of onions. Delicious. I saw some very strange recipies here.